If you are like most 4×4 truck enthusiasts, one product that continues to surprise is the Ford F150. The F150 is the bread and butter of Ford and while this car and truck company is on the economic ropes right now, they are still creating some great vehicles- one of them is to appear late next year as a 2010 model, it’s the Ford F150 SVT Raptor. While it sounds like a fighter jet, it will definitely shake up truck manufacturers everywhere and put a smile on most truck owner faces. This pick up not only looks great, but also delivers plenty of performance and utility. 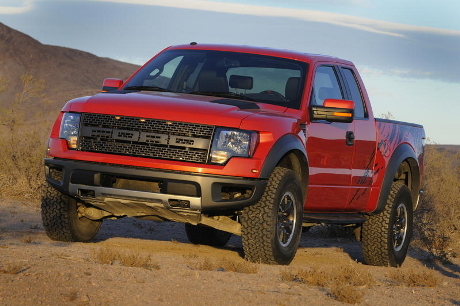 The Ford F150 SVT Raptor is definitely not pretty. This is a real truck through and through and you can see the rough exterior and the purposeful stance in the grill of this pick up. Everything on this truck is built with some muscular style to it. While it definitely has strength, it doesn’t look like a kid’s truck- it definitely has a nice style to it. In addition to the great exterior features, this truck has some pretty serious tires. The tires are 17 inches and 8.5 inches wide, all terrain tires- Raptor spec BF Goodrich. With nice tires also comes some good looking gun metal wheels. There will be two engine options, a smaller SOHC Triton V8 that creates about 310 hp and 365 lb ft of torque- which is also flex fuel capable and a premium engine that offers a 6.2 L 2V SOHC. This engine will have plenty of power rated at over 400 hp and 400+ lb ft of torque. Both of these engines should be matched with the new 6 speed automatic transmission. All in all, this is one truck to watch out for. We will keep you posted on any news regarding the Raptor.